Good event planners see potential in many a non-traditional venue including spaces that, at first blush, have “day jobs” as other businesses. We’re talking hybrid venues such as retail shops, art galleries, public places and more. Queen Richmond Centre WestWhere: The lobby of the Queen Richmond Centre West (QRC West), a 17-storey office tower from Allied Properties Reit, designed by Sweeny & Co. Architects. The Space: While still under partial construction, the building is a testament to heritage preservation with stunning glass lobby and office tower suspended over existing restored brick-and-beam buildings. The public space, a light-filled, 70-ft.-high atrium, is beautifully enhanced with wood-slat ceiling and exposed brick of the two heritage properties. 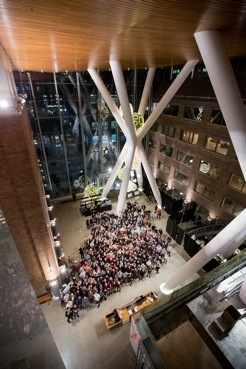 Stunning white tubular steel “jacks” soar floor to ceiling in prominent “X” clusters that not only structurally support the lobby and tower above, but make for unique art installations and spectacular event backdrops. Ricarda’s restaurant moves in this summer with a feature staircase leading to its wine bar overlooking the atrium. Catering: On-site amenity providers include a coffee shop and Ricarda’s when it opens. For now, catering is planner’s choice with the spacious lobby easily accommodating several food-bar stations. Event Bonus: QRC West’s location is conveniently embraced by the entertainment and financial districts. Planners can also tick a green-venue check mark in the plus column as the building pursues LEED Gold certification. Where: Pachter Hall and Moose Factory, home, art gallery and studio of famed contemporary Canadian painter, print maker and sculptor Charles Pachter, in Chinatown on Grange Avenue, a block west of the AGO. The Space: Post-modern industrial chic is everywhere in this stunning, award-winning Stephen Teeple & Associates architectural masterpiece. 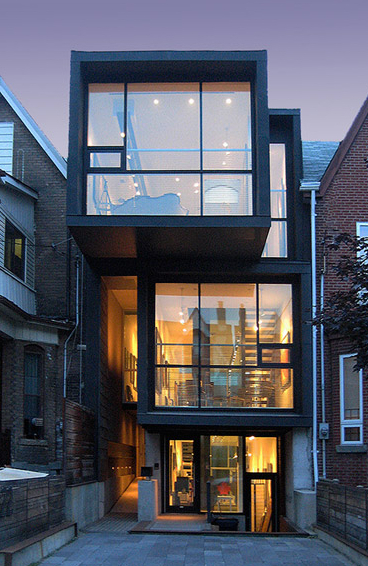 Three stacked structural boxes, fronted by floor-to-ceiling windows, rise dramatically above the residential street. Light, bright and spacious, stage events in the upper and lower galleries where Pachter’s colourful, iconic art, including signature works of the Queen, moose and the Canadian flag, pops off the walls. A glass-atrium walkway connects the galleries along with a small courtyard housing a majestic Chinese warrior sculpture standing guard in the corner. Capacity: There’s loads of mingling room for 60 to 80 guests in the upper back gallery with overflow into the street-front’s lower area which often doubles as pre-event space and coat-check. Catering: BYOC — bring your own caterer. Many a top city food purveyor has given thumbs up to the amenities of the on-site catering kitchen. Event Bonus: A passionate and entertaining historian, Pachter, who resides on the top two floors, is happy to regale guests with stories of his art, the industry and gallery. Postcard-size prints and autographed art books make for memorable event gifts. Where: Rainhard Brewery, a 2015 Golden Tap award winner for Best New Brewery in Ontario, sits smack in the middle of The Stockyards’ old industrial landscape at St. Clair and Keele. 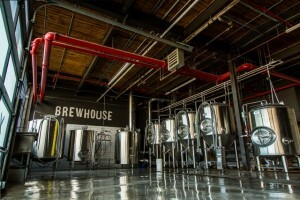 The Space: Clocking in at 3,000-sq.-ft plus, this microbrewery doubles as a multi-use, event-savvy warehouse-chic space. Daylight spills in through generous windows, enhancing the steely beauty of the fermenting and brewing tanks. Kegs and neatly stacked malt bags subtly divide production space from tasting counter/bottle shop, enhancing open-space mingling and interaction. Strings of dangling, naked light bulbs add further charm, weaving aerial paths above the hand-hewn 10-seat L-shaped wood bar. Order up tasting flights and beer-learning under owner-brewmaster Jordan Rainhard’s tutelage. Garage doors make for easy load in and out. Catering: On tap: Rainhard’s artisanal ales, of course! 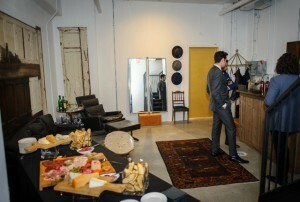 Stasis Preserves deliver up the deliciously loaded charcuterie-cheese plates sold on-site. Otherwise, catering-in is planners’ choice. Note the versatility for food trucks and BBQs in the expansive parking lot. Event Bonus: Work up a teambuilding sweat at neighbour The Monkey Vault, an indoor/outdoor movement training centre, before event-chilln’ in the brewery. Where: Butcher shop by day, bar by night is Roncesvalles Village’s Barque Butcher Bar, located a few doors south of successful restaurant sibling Barque Smokehouse. The Space: In a word, clever! At 6 p.m., hinged wooden panels flip down over the shop’s meat display cases, grocery items are stashed and bar stools appear, transforming the retail counter into a roomy bar top. Richly hued butcher-block dining tables and a leather banquette run parallel to the retail-open kitchen which serves hungry daytime shoppers and evening tipplers. Back-of-house affords semi-privacy with a few multi-seat high-top tables backdropped by a generous block-glass window. Upfront, an old apothecary unit displays house-made sauces and condiments for sale, with spices and seasonings for DIY rubs tucked away in its many neatly labeled drawers. Catering: Order up from the bar menu’s drink-friendly small plates or customize from Barque Events catering menu for a full-on feast of its signature smoked brisket, pulled pork and more. Event Bonus: For groups of up to 10, hands-on cooking sessions reveal the secrets to achieving barbecue perfection in an oven or a smoker. Where: St. Paul’s Bloor Street, a circa 1840s Anglican church that bookends Bloor Street’s Mink Mile on the east side, between Church and Jarvis. 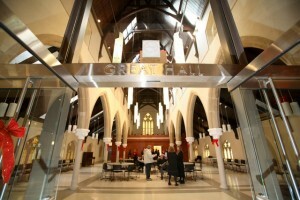 The Space: Three buildings comprise this historical church, all connected by a naturally lit atrium. Graceful wooden arches, stone columns, magnificent stained glass windows and exposed limestone walls make for elegant interior features, especially in the Great Hall, the grand main reception room. Take to the stage in Cody Hall. Permanent theatre-style balcony seating rings the blank-canvas of the large, main-level space which offers a blank canvas for ultra-flexible staging. In addition, there’s a spacious gymnasium along with six variously sized meeting and breakout rooms, all available with on-the-house tables and chairs. Catering: With an in-house executive chef, St. Paul’s offers an extensive catering menu covering early a.m. to evening dining needs, including appetizers, sit-downs and buffets. Event Bonus: A dedicated event staff oversees the seamless stream of on-site events. In summer, stage a reception around the courtyard’s bubbling water fountain. 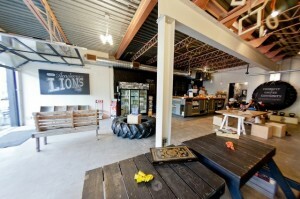 Where: Ossington strip’s Academy of Lions, a crossfit and personal training gym. The Space: This ain’t your typical fitness centre. Devoid of the usual calibrated equipment, spinning cycles and treadmills, the shell of this former machine shop remains in place, now peppered with heavy ropes, bars, and weights. Steel girders line the ceiling, cement, the walls, and black tread rubber, the floor, for a funky, raw industrial aesthetic. With three storeys and 10,000 sq. ft., events have room to play. In summer, garage doors roll up on the gym’s street-front general store and café furnished with rustic tables and seating. For large crowds, add in the expansive main and second-floor workout spaces. A studio space on three is ideal for smaller private gatherings. Catering: The café is well stocked with healthy choices — smoothies and organic snacks — and pours an amazing buttered coffee. Cater in for more substantial party eats. Where: Love & Greed, a new upscale men’s clothing boutique in Parkdale on Queen Street West at Dufferin Street. The Space: Follow the black metal stairs leading from the fashion-primo shop’s gorgeous main space to a lower-level, intimate, speakeasy-style room. 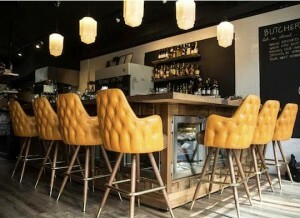 A custom wood bar lines one wall – whiskey is the house drink. Decor is minimal, with black leather loungers, a double mirror (it’s a fashion shop, after all!) and reclaimed barn wood wall pieces adding to the secret basement vibe. Versatile spotlighting in the exposed industrial ceiling easily positions its beams for ambient mood and room accents. Catering: The Commodore is the shop’s fave local food partner, however, planners are welcome to cater in their choice eats plus BYO drinks with a special occasion permit. Event Bonus: Make Love & Greed a unique pit stop in a food-and-bevvy crawl of Parkdale’s hottest spots. Owner Sunny Singh Bansal can also curate accessories and fashion items for event gift bags.